It was an extremely proud moment for The King’s School last night at the Canterbury Design Awards where Kingsdown House, our newest girls boarding house, picked up three awards. 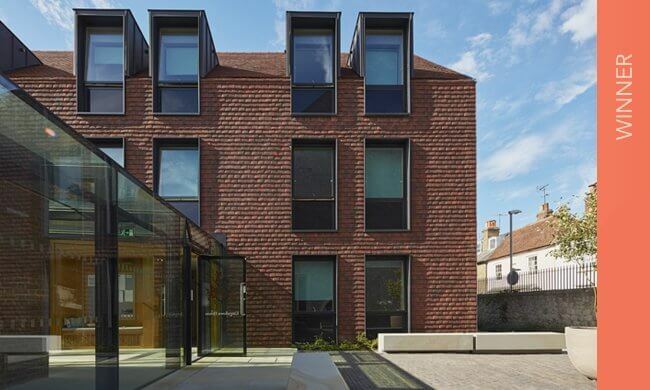 The wonderful work by our architects Walters & Cohen was duly recognised by the judges as the building won the ‘New building in a Conservation Area’ award, followed by the ‘Refurbishment’ award and was also crowned the ‘Overall Winner’ to top a wonderful evening. On picking Kingsdown House as the overall winner the judges said: “It is an exemplary and intelligent project on all fronts: the elegant and sensitive refurbishment of historic buildings, the scale and form of the new boarding wing, quality detailing throughout, the transparent connections between new with old, and the exquisite landscaping. It is our clear overall winner”. The Canterbury Society Design Awards aim to recognise and celebrate buildings, spaces and places that are loved by our community. The Awards celebrate projects nominated by the people who live alongside them and use them and who have a real understanding of their impact on the local area.